Hope's Cafe: Contigo Travel Mug-Review and Giveaway! You may be thinking it's too hot for a travel mug-after all, even I don't drink hot coffee when it is this hot out. But, this travel mug isn't just for hot drinks; it is insulated so it keeps hot drinks hot and cold drinks cold! I received a Bella Double Wall Insulated Mug from Contigo for review, and this has come in so handy the past couple months! With unique Autoseal technology, it is pretty near impossible to spill your drink in this mug! Press a button as you take a sip, and as soon as you release the button, the lid automatically seals shut. No spills! So it's great for taking in the car, whether long trips or just running errands around town. I love filling mine with ice water or ice cold sweet tea, and it stays cold for several hours! It's cheaper and easier than having to stop and buy a drink every few hours on a trip, and I feel safer knowing the cup won't leak all over my console :) I also enjoy using this while working in the yard. Lately we've been redoing our front lawn; in 2 days we planted about 50 new plants. Can you say HOT WORK?! It was nice to have my mug full of iced tea sitting nearby so I could stop for a quick drink whenever I got thirsty! This is definitely my new travel-and-outdoor-work companion! "Contigo® travel mugs, water bottles, kids cups, and coffee mugs are for savvy consumers who seek solutions to the daily challenges of their active lifestyles. Knowing that on-the-go beverages can be messy and complicated to use, Contigo® developed a line of simple, yet functionally innovative, environmentally friendly drinkware to help people face life’s daily challenges. The products are stylish, yet resilient; sleek yet strong – the perfect combination of performance and grace. Contigo® products give consumers the confidence they need to face the day and pride in knowing that they bought the best of the best. Contigo® recently developed a full line of travel mugs, water bottles, and kids cups featuring revolutionary patented AUTOSEAL® technology that automatically seals between sips, forever changing the on-the-go beverage drinking experience. The products – thermal travel mugs, water bottles and kids cups – are 100% leak-proof and spill-proof with superior insulation properties that keep beverages hot or cold longer. Contigo® is passionate about the products they create and believes consumers will be pleasantly surprised by the array of helpful innovations that the brand offers. 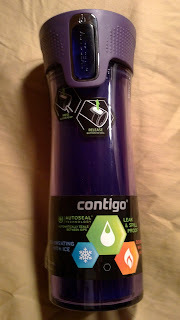 Headquartered in Chicago, Contigo® is a brand of Ignite USA, LLC, a company with a passion for great products." Contigo is giving a Bella Double Wall Insulated Travel Mug to one of my readers!! Go to Contigo and tell me another product you like! 1 entry-Follow Contigo on Twitter. 2 entries-"Like" Contigo on Facebook and tell them you entered the giveaway at Hope's Cafe! 1 entry-Tell me your favorite beverage to take along on trips! This giveaway ends Friday, June 24, 2011, at 11:59 p.m. Please leave a valid email address in each comment, as this is how the winner will be notified. Winner will have 48 hours to respond, or another winner will be chosen. Giveaway open to US residents only. Disclaimer: I was not monetarily compensated in any way for this post. All thoughts and opinions are mine. All quotes taken from the Contgo website. I also like the West Loop Stainless Steel Travel Mug. my favorite take-along beverage is coffee. I love the kids Stainless Steel Scout...though I am partial to the one you are giving away because my daughters name is Bella! Thanks for the giveaway! I like the Aria Travel Mug. I actually prefer cold beverages most of the time, so my favorite to take along in lemon Iced Tea. I like the Kids Travel Mugs. They would be great for my boys who always manage to spill something in the car. My favorite drink would be COFFEE. I also like the West Loop Stainless Steel Travel Mug! I also like the West Loop stainless steel bottle! i like the AUTOSEAL® Kangaroo Water Bottle with Storage Compartment - 24 oz. I like the Kangaroo Water Bottle. Please enter me. Thanks!